If you need information about planted aquarium workshops, or if you've found an error, I need to hear from you. I also need to hear what you have found helpful and what you dislike about this web site. Please let me know if anything is missing, unclear, or anything else that contributes directly to making this web site better for everyone. 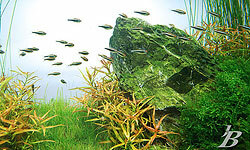 That includes articles that you would like to see, reviews that you would like to see, planted aquariums that I should see, or personal experiences you would like to share about products or approaches. So many of you have many great comments or questions about planted aquariums, but please remember that I am only one person. If it takes me a little bit to get back to you, I apologize....please be patient.